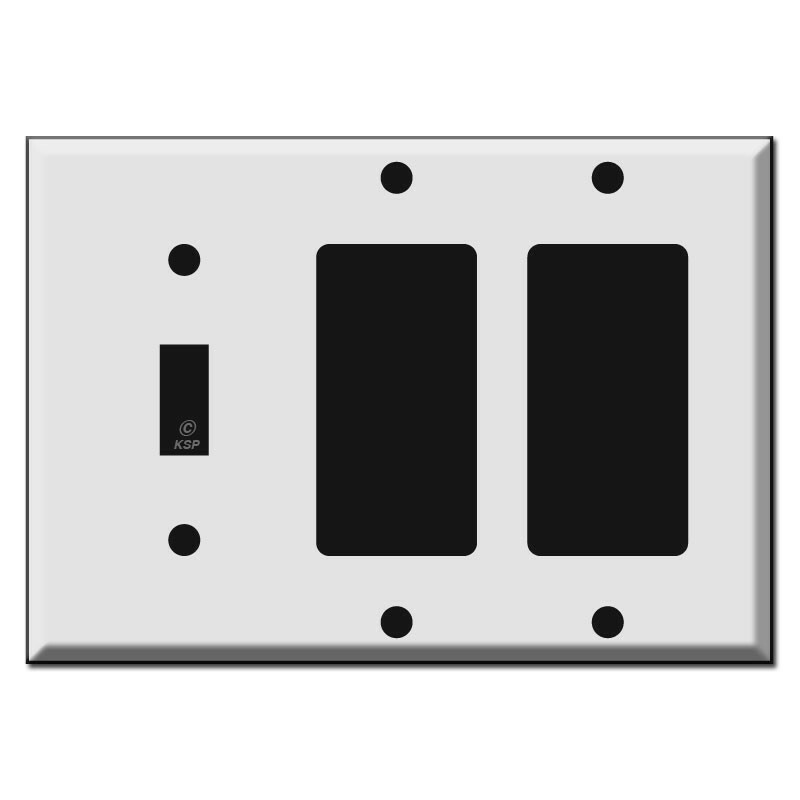 Switch plates come in a variety of sizes including Standard, Narrow, Mid-Size, and Oversized (also called Jumbo). 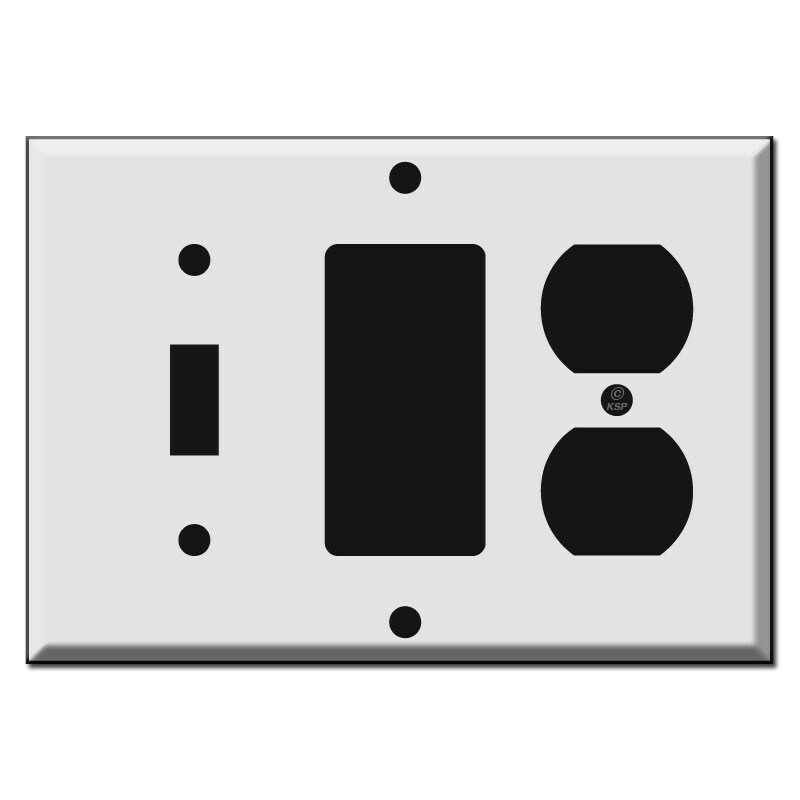 While standard, mid-sized and oversized switch plates are typically the same dimension, narrow plates come in a variety of widths: 1-3/4″, 2″, or 2-1/4″. It may be difficult to find the exact plate you’re looking for because it’s not a standard sized plate. If you’re unsure, measure the plate that needs to be replaced (if you have it) or the area of the wall that needs to be covered. The size of the plate will not effect the size of the opening for the switch, just the area of the wall that is covered. Then visit Kyle Switch Plates’ Wallplate Sizing Guide to find what you need. You may have a switch plate that looks like a standard Decora Rocker (shown above, far left), but the sizing of the hole for the switch or the overall dimensions are off. If your home was built in the 1950s, 60s, or 70s, you may have an Old Style Switch Plate which would explain why you’re having a difficult time finding a replacement. Order Old Style Switch Plates at http://www.kyleswitchplates.com. If you need a combination plate with more than 1 or 2 styles of device openings (like a Toggle, Decora Rocker, and Duplex Outlet all in 1 plate), it can be difficult to find the wallplate you need in stores. The best place to look for combination wall plates is online at Kyle Switch Plates Online Store of Combination Switch Plates. They have the largest selection of irregular switchplates on the web and they’re available in a variety of colors. With hundreds of combo switch plates, you’re practically guaranteed to find the one that’s right for you. If your switch, outlet, or plate is not white or ivory, you’re limited to what you can find in stores and you may have been told the part you need doesn’t exist! Kyle Switch Plates keeps a large stock of switches, electrical devices, and wallplates in their warehouse that are not only white and ivory but also stainless steel, black, brass, almond, bronze, oil-rubbed bronze, gray, copper, brown, and tons more. 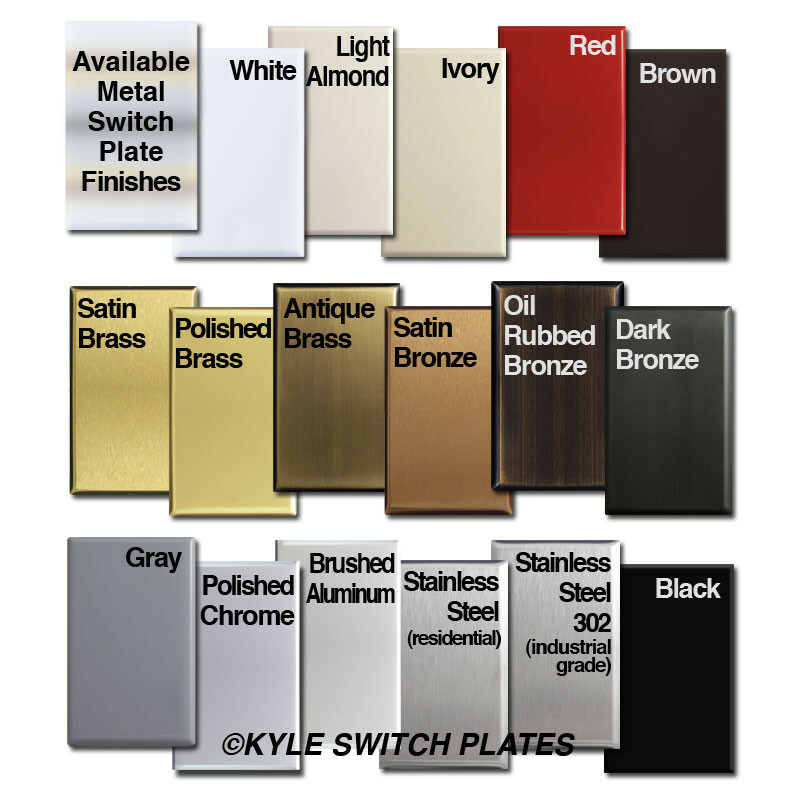 Shop Switches & Electrical Devices or Switchplates by Color at Kyle Switch Plates. If your house was built in the 1940s, 1950s, 1960s, 1970s, or 1980s, you may find that your switches and wall plates don’t look like the “regular” ones you see in more modern homes. If so, there’s a good chance you have a Low Voltage Lighting System and your best source for replacement switches and switch plates is Kyle Switch Plates. Keep reading for more information about Low Voltage Systems (Reason #5) and discontinued switches and plates (Reason #6). As we mentioned in Reason #1 above, you may have a wall plate that looks very similar to a Decora Rocker with a rectangular opening, but the sizing is off. If your home was built in the 1950s, 1960s, or 1970s, you may have an Old Style Wall Plate which you can buy online from Kyle Switch Plates – click Old Style Light Switch Plates. If your home has a low-voltage lighting system, finding replacement switches and plates can be difficult. Your electrician may even tell you that they’ve never seen a system like yours before. Yikes! Your best source for information about low-voltage systems is Kyle Switch Plates – on their website you can determine which type of low voltage system you have, purchase hard-to-find low voltage parts including relays, switches and switch plates, and find helpful wiring diagrams. They have everything you need for GE Low Voltage, Bryant, Remcon, Sierra and Despard, and Touch-Plate low voltage systems. You can also call them direct to get help determining what you have and need. Many low-voltage devices have been discontinued, which means you’ll never find a replacement in stores. But, for every system that has been discontinued, Kyle Switch Plates has a solution and everything you need to get your old system converted to a currently manufactured one. They’ve tracked down every switch that is still being made, which you can purchase on their website. They even manufacturer their own line of affordable replacement switch plates for GE systems that you won’t find anywhere else. Visit Kyle Switch Plates’ Low Voltage Lighting Store to learn more and find the parts you need. If your switch and cover plate are different from “regular” ones like Toggle and Decora Rocker and you’re sure you don’t have a low-voltage system, you may be looking for Despard or Push Button switches and wallplates, or Louvered, Deep, Round plates or plates with rounded corners. Check out what’s in stock and ready to ship in the wallplate warehouse at Kyle Switch Plates. This entry was posted on April 16, 2012 at 12:48 pm	and is filed under Electrical Devices, Switch Plates, switchplates, Wall Plates. Tagged: combination switch plates, discontinued swtich plates, GE low voltage, hard to find switch plates, hard to find swtiches, irregular switch plates, lighting for older homes, low voltage lighting systems, narrow switch plates, odd sized switch plate, outlet covers, oversized switch plates, specialty switch plate, switch plate guide, switchplates, wallplate warehouse, wallplates. You can follow any responses to this entry through the RSS 2.0 feed. Responses are currently closed, but you can trackback from your own site.